We just *love* Tamiyah’s photo! In it, we see a confident, joyful, comfortable young woman. But what is the story behind the great smile we see in the photo? Because there has to be a catch, right? Sorry to disappoint you, but Tamiyah’s reality is pretty boring, but in a good way! That confidence, joy, and comfortable ease you see in the photo is authentic. Tamiyah is also a motivated and funny young woman who loves to play basketball and just be a kid when the opportunity presents itself. 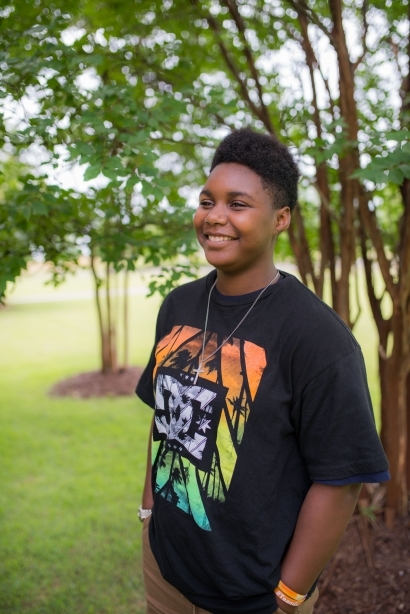 Like any other teen navigating the sometimes choppy waters of young adulthood, Tamiyah doesn’t always respond well when she has to do something that she doesn’t feel is needed or when she has to wait for something she wants. But she always comes around quickly and bounces back to her normal happy self. Her forever family will need to be patient in these situations and provide structure and consistency. Tamiyah will reward that parenting with more of that great smile of hers and a lifetime of love and amazing accomplishments. She just needs the chance to show you what she can do.